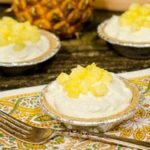 A recipe for Creamy Pineapple Tartlets that are little tarts or pies made with fresh pineapple, condensed milk, cream, and graham cracker crust. Cut pineapple into small pieces. Reserve and chill 1 cup for garnish. Place 3 cups in a food processor fitted with a knife blade. Pulse a few times to chop into smaller bits to make crushed pineapple. Be sure to pulse only because letting the processor run steady will turn it into pineapple sauce. Place crushed pineapple in a fine mesh sieve or strainer over a bowl to drain for 10 minutes, stirring occasionally. Stir together sweetened condensed milk and 1/4 cup of the drained juice in a large bowl. Add 1 cup crushed pineapple and stir to combine. Save any extra crushed pineapple and juice for another purpose. Beat cream in a separate bowl until stiff peaks form. Fold whipped cream into pineapple mixture. Spoon into tart shells and chill for at least 1 hour. Garnish with fresh pineapple pieces prior to serving. *You can substitute one 9-inch graham cracker crust to make a pie instead of tartlets.